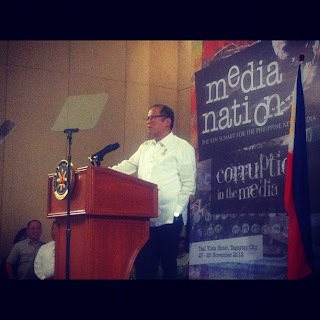 President Benigno S. Aquino S. III on Friday, November 23, 2012 delivered speech at Taal Vista Hotel, Tagaytay City for the 9th Medianation Summit with the theme "Corruption in the Media". The event has been the top 1 trending topic on Twitter Philippines, Friday afternoon. Present at the event are media big bosses, journalists, media practitioners and bloggers. Here is the full text of speech of the president, copy courtesy of gov.ph. "Magandang hapon ho. Maupo ho tayong lahat. Kanina ho pagpasok ko, nagulat ako na ang tagal ko na hong kilala ang karamihan sa inyo. Hindi na natin babanggitin ‘yung edad. Basta alam na rin n’yo kung kailan tayo umpisang magkakilala. Pero, the thought that really entered my mind was: there really is a “gerenational” shift. Parang, not too long ago, a lot of you were the “up-and-coming stars” of media. Now, you are—how should I put it delicately [laughter]—the most respected individuals in media. [Laughter] So, Parepareho lang tayo. Dati ho, mayroon tayong mga mas nakakatanda na at the end of the day, sila ang may responsibilidad… Ngayon po, tayo na po ang may responsibilidad. Can I get everybody to relax and say first that—I just came from the ASEAN Summit where I endeavored to be my most diplomatic self and there’s still a glow from that. If I could withstand certain impositions by other quarters who are not my countrymen, I think I can be more diplomatic with my countrymen. From the very start, we have always sought to institute honesty, transparency, and accountability in government. And while we still have a long way to go, our efforts have already borne fruit. For example, our reforms are often cited when speaking of how we have vastly improved our viability as an investment destination. We remain cognizant that corruption and inefficiency still exist, and though the road ahead will not be without its challenges, we will continue to work for the success of these reforms. But government does not exist in a vacuum. For these reforms to take root and flourish, we need corresponding efforts in other sectors. Business and industry have already undertaken such endeavors; and I am glad to see the beginnings of similar measures in your industry here—that you have adopted “Corruption in Media” as its theme. This, I believe, is an acknowledgement of an existing problem, and more importantly, an indication that this is an issue you want to address. I know that in the past, individual practitioners in some organizations have tried to move in this direction, but I believe that a concerted industry-wide effort is necessary and infinitely more effective. Before going further, I must clarify: this is not a pitch for government to take an active role in media regulation. I have seen the harmful effects of state-controlled media; and I am old enough to remember how, before Martial Law, media was held in high regard, and considered the journal of record. Martial Law changed that, turning a noble profession into a propaganda machine, with those in power censoring and even punishing those who spoke the truth—my father included. But, also having seen the price our country paid to regain freedom, I believe it is incumbent on all of us to continually improve the standards to which we hold ourselves and to insist on accountability—from public officials to journalists like you. Solidarity can produce tangible outcomes that can lead to greater public trust in media: the lack of common standards, and corruption in your industry. The first is about the need for consistent standards in media. Like any profession imbued with public interest, at the heart of skepticism or even hostility lies the question of conflicts of interest—and with regard to this, there are many questions left unanswered. For instance, what are the parameters concerning endorsements? What are the requirements for sources? And when anyone is unhappy with how a media person conducts himself, what are the mechanisms for redress? Citizens can go to the Ombudsman when it comes to public officials. Who can Juan dela Cruz run to in your industry? Of course, no one can answer these questions as effectively and as practically as you can—and there is a great need for these answers. While the lack of standards that apply throughout your industry does not directly lead to corruption, it does make it easier for corruption to take place. The more discretion you give someone, the more leeway they have to make decisions—not necessarily based on a common set of rules and regulations, but on their own desires. The idea is not to make life more difficult, but to make it easy for everyone to do the right thing. This is at the heart of the reforms we are implementing in government. The standards of integrity, transparency, and accountability apply to all public servants, from the lowliest clerk, to those in the highest echelons of power. If the standards hold for all, so do the penalties: from the customs clerk removed from his position due to unexplained wealth, to a Chief Justice removed from office for failing to declare around 98 percent of his cash wealth. This is what we have been working to enforce. It also falls upon you to enlighten the public further on the difference between opinion and reportage. These days, the line between the two seems thin and easily crossed. This is already a topic of debate within your ranks, which perhaps gives you an added impetus to settle the issues once and for all. The second thing I want to talk about goes to the heart of what you are discussing among yourselves today: corruption in your industry. Those outside media engage you first and foremost not on the level of the publisher or the editor, but on the level of the reporter. The reporter bears the brunt of having to find stories, source information, and craft the reports that find their way to our countrymen. Given the hard work they do and the high standards everyone should demand of them, it becomes legitimate to ask whether their pay and benefits are commensurate to the highest standards of integrity demanded of them. This is no different from the concerns that government and the private sector must bear in mind for all employees, who play such important roles in their operations. We in government are already trying to rationalize and reform our system of pay, benefits, and bonuses—not only to eliminate the temptation of corruption, but also to compensate our employees adequately for their work. This is a concern for all of us precisely because we are dealing with people’s lives. Similarly, there is a need for mechanisms that can reassure your readers, viewers, and listeners, that if they feel aggrieved, they can find an advocate within your ranks to resolve their concerns quickly and fairly. I am not here just to make suggestions. As with other sectors, we want to work with you towards the advancement and protection of your profession. In cases of media killings, for example, we in government are demanding the apprehension of suspects and the filing of charges that stick, resulting in justice for all involved. In other cases of violence involving media, we have taken affirmative and just action. For instance, you may have heard of a governor who was suspended after assaulting a broadcaster on air. More than anything, the protection of the rights of all—journalists included—relies on the fair and impartial dispensation of justice. As the saying goes, “Justice delayed is justice denied,” so our courts must work efficiently. We must have courts that are impartial and fair in the verdicts they hand down. If the courts demonstrate impunity at the top, then the lowest regional trial courts will follow suit. This is why I have been so focused on reforming our justice system. The relationship between media and government is unique—you have extraordinary access to officials, and you are among the first to hear of new developments. Truth be told, though we may work in different spheres, we serve the same audience: the people. And it makes sense for us to cooperate on overlapping issues, for their benefit. As regards proposals that lead your industry to close ranks—from right of reply to libel: basic fairness should suggest that these proposals are not motivated merely by hostility to media, but that there may be cases where people are genuinely and justifiably aggrieved. Instead of shutting the door, let us engage in respectful dialogue, so that we can reach a consensus that is fair to all concerned. For instance, the decriminalization of libel should not be license to commit it. With a media entrusted with greater responsibility and a greater awareness of the import of your work, you will better fulfill your mandate, and gain even more trust and renown from your audience. All these questions must be addressed at a time when all of us—whatever sector we are from—are living in a period that can only be described as one of creative destruction. This is due to the 24/7 news cycle, where mainstream media is no longer the sole gatekeeper of the news, and where enforcement and the spread of information can take place on the level of the common citizen because of the rise of social media. The very standards that have allowed media to be considered the fourth estate—vetting facts, objectivity in reportage, and speaking truth to power—are all challenged by the need to break the story first. Success or failure is now measured in milliseconds, where you must be the first to Tweet, or post online. In facing these challenges, allow me to suggest that the same reason I have grown in faith and optimism about the country’s prospects should be the same reason for you to have faith and optimism in your industry’s potential: the Filipino people. They are clamoring for change; and they can tell whenever one of us is being fair or unfair, reasonable or unreasonable. Our core values should not be any different from that of our people. They do not want this country to fail. They believe that the potential is vast. And they know the challenge that needs to be addressed: poverty borne of corruption in its many forms, which closes off so many avenues for improving our lot in life. I have always believed that the media is both the bulwark of freedom, and an instrument for empowering our fellow citizens to take responsibility for their actions, and achieve positive change. Right now, I have the privilege of being able to serve the country from this position. My door is always open, and I am here to listen to you, and to work with you. I have said nothing that your own readers, viewers, and listeners have not already said themselves. For that matter, I hope you view my presence here not as that of a President, but as of someone who has read your newspapers and watched your shows long before being elected into this position, and who will continue to do so after I step down. And with that, I bid you all a good day and thank you. "